The disorder began when police attempted to block part of the route for the Anti-Internment League parade. TWENTY-SIX PSNI officers and two members of the public were injured during loyalist rioting in Belfast city centre last night. Of those 26, five required hospital treatment for their injuries. Officers were pelted with bricks and other missiles, as hundreds of loyalist demonstrators gathered to protest against the rally. A number of parked vehicles were also set on fire. The clashes first broke out at the junction of Royal Avenue and North Street, Belfast. It then spread to Carrickhill, Peters Hill and Millfield areas and members of the public were advised to avoid the areas. During the disturbances, officers deployed water cannon and 20 AEPs . Assistant Chief Constable George Hamilton said attackers were “intent on creating disorder”. “As Northern Ireland moves ahead, the effect of the violence has the potential to damage the local economy and the reputation of Belfast as a tourist destination,” Hamilton added. 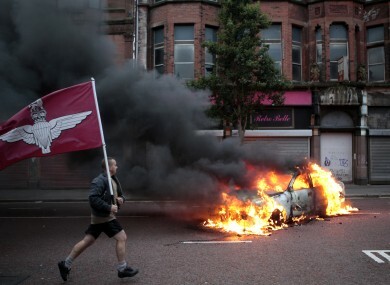 Email “In pics: 26 PSNI officers injured in violent clashes in Belfast city”. Feedback on “In pics: 26 PSNI officers injured in violent clashes in Belfast city”.